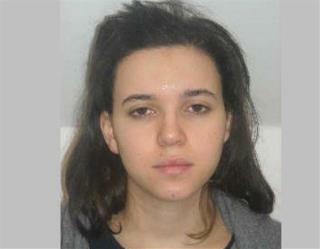 (Newser) – As police in France track down accomplices of the Kouachi brothers, a 26-year-old woman named Hayat Boumeddiene is near the top of the list. She is the widow of Amedy Coulibaly, the hostage-taker at a kosher market in Paris who was killed in a police raid yesterday. The two were married in an Islamic ceremony in 2009, though the marriage is not recognized by French law, reports AP. Police consider her armed and dangerous, and lots of French newspapers are running one photo in particular of her posing in a head-to-toe veil and holding a crossbow. Boumeddiene herself has never been convicted of a crime, though she has been questioned previously by police about Coulibaly and al-Qaeda. Authorities suspect she was with Coulibaly when he fatally shot a French policewoman this week. what the hell. what kinda nightmare do you have to be raised in to end up like this ? What the hell would a girl like her want with a thing like that ?